Here’s what’s up in the world of TV for Sunday, January 22. All times are Eastern. NFC Championship, Green Bay Packers at Atlanta Falcons (Fox, 3:05 p.m.): A lot of us are uncertain, terrified, and simply weirded out in this new America of ours. But if nothing else, we can take comfort in the ritual of the Sunday football game, and that if we can no longer trust our institutions we can at least trust the arm of Aaron Rodgers. 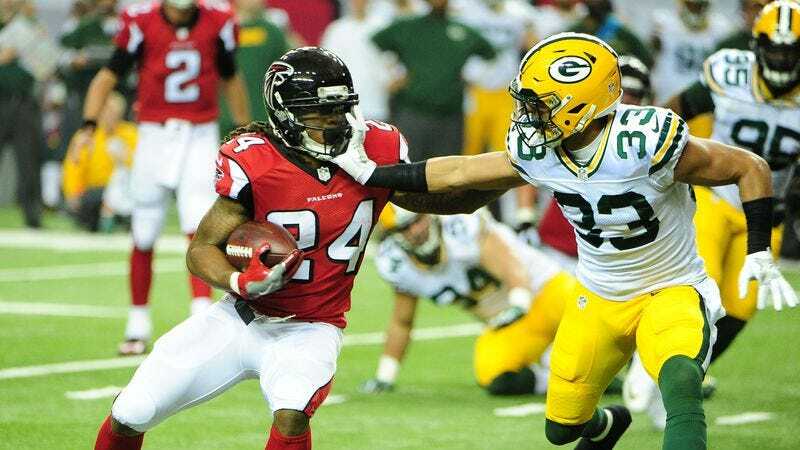 The white-hot Packers travel to Atlanta for a gunslinger showdown with Matt Ryan and the Falcons, with the winner going onto the Super Bowl in a couple weeks. As ever in these circumstances, we offer the Giant Spider Invasion prayer. AFC Championship, Pittsburgh Steelers at New England Patriots (CBS, 6:40 p.m.): Fighting for the other slot in the Super Bowl are Ben Roethlisberger and Tom Brady, with the AFC championship in Steelers country. Your What’s On Tonight correspondent is reluctantly backing the Patriots because he hasn’t forgiven the Steelers for a game that led to a one-point loss in his fantasy football league earlier this season. The Young Pope (HBO, 9 p.m.): The rumors were true, and The Young Pope (despite not being all that young in the grand scheme of things) is every bit as bugnuts entertaining as Eric Thurm and the rest of the Internet led us to believe. Tonight, the fallout from Lenny’s worryingly heartless first address ripples through the Vatican as Cardinal Voiello and Sister Mary jockey to define his doctrine to the masses. We assume while they do that Lenny will spend the time trying to put sunglasses on his new pet, because his deepest of deep secrets is an unabashed love for the film Kangaroo Jack. Mercy Street (PBS, 8 p.m.): The season-two premiere of this antebellum medical drama deals with the fallout of last year’s aborted bombing plan, as well as “a former slave-turned-abolitionist” who causes a rift between Dr. Foster and Mary Phinney. Might Frederick Douglass be bringing his legendary oration and facial hair to the halls of the Mansion House Hospital? The Librarians (TNT, 8 p.m.): “The Librarians’ two-front battle comes to a head when the Library is simultaneously infiltrated by DOSA and Apep.” According to Wikipedia Apep is the ancient Egyptian deity of chaos, a perfectly reasonable foe for Flynn and company to go against, but dosa is a type of pancake made from a fermented batter native to southern India. Seems an odd thing to infiltrate the Library, but Apep might subscribe to the Bill Cipher school of torment and emphasize the weirder aspects of chaos. Havana Moon (Starz, 9 p.m.): Last March the Rolling Stones performed in Cuba for the first time ever, and tonight Starz is airing footage of the concert. It’s unknown at this time what legal difficulties they ran into given Carlos Santana already took that title for a 1983 album of Bo Diddley/Chuck Berry covers. Secrets Of The Six Wives (PBS, 10 p.m.): The love of the monarchy never truly goes away on public broadcasting, following Victoria with a documentary miniseries on the unfortunate wives of Henry VIII. First up, Catherine Of Aragon, whose inability to give her husband a son led to England’s schism with the Catholic Church and the passing of the Acts Of Supremacy. And we’ve now cited the Acts of Supremacy two weeks in a row, which earns us a very specific prize in the grand game that is writing What’s On Tonight.